is a sacred building located near Monticchiello, in the town of Pienza, in the province of Siena, Diocese of Montepulciano-Chiusi-Pienza. 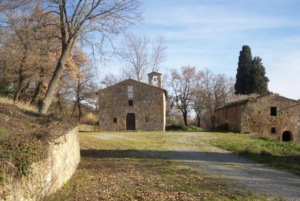 It belonged to the Diocese of Chiusi until the creation of that of Pienza in 1462. In 1500 it was falling, and was rebuilt, as attested by a plaque in the façade, by the Saraceni family in 1570. It is currently being officiated once a year on the feast of Corpus Christi. It is presented with a sandstone façade and a small bell tower. With a single nave, it has probably undergone restorations in the eighteenth century, as shown by the only altar of baroque shapes.